Manitoulin Island on Lake Huron has none of those. Instead, you will find trophy bass on the end of your line, 200-year-old cedars lining the shore and local watering holes serving great Canadian beer on tap. Just to remind you salties out there, the Great Lakes are fresh; you can open your eyes when you swim, you can fill your water tanks with it and your boat lasts forever. Manitoulin is the largest fresh water lake island in the world at over 100 miles long and 50 miles across. The island’s population is small, but its single stoplight doesn’t keep it from being designated a Canadian National Dark Sky Sanctuary. Archaeological digs confirm the island had Paleoindian settlements at least 10,000 years ago, and Canada’s First Nation members still make up nearly half of the island’s residents. Coming up from Lake Michigan or southern Lake Huron, you can’t step ashore until you check in with Canadian customs at tiny Meldrum Bay, bustling Gore Bay or strategically located Little Current, all of which are on the island’s north coast. Once the customs paper work is done, check out the towns themselves. Meldrum Bay, despite its small size, features an inn with the best food west of Toronto. Gore Bay’s marina is fully protected by a new breakwater, and the town is just a few blocks away. Even easier provisioning with its docks right on the main street is Little Current, which is also home to a cruiser’s net. At 0900 every day you can get weather, news, sports and local doings, plus find out where all your buddies are from the daily call-ins. From Manitoulin, many cruisers continue on toward Lake Huron’s North Channel or northern Georgian Bay to explore the scenic anchorages on the Canadian mainland. But those adventurous few who choose to remain and explore Manitoulin Island itself are seldom disappointed. 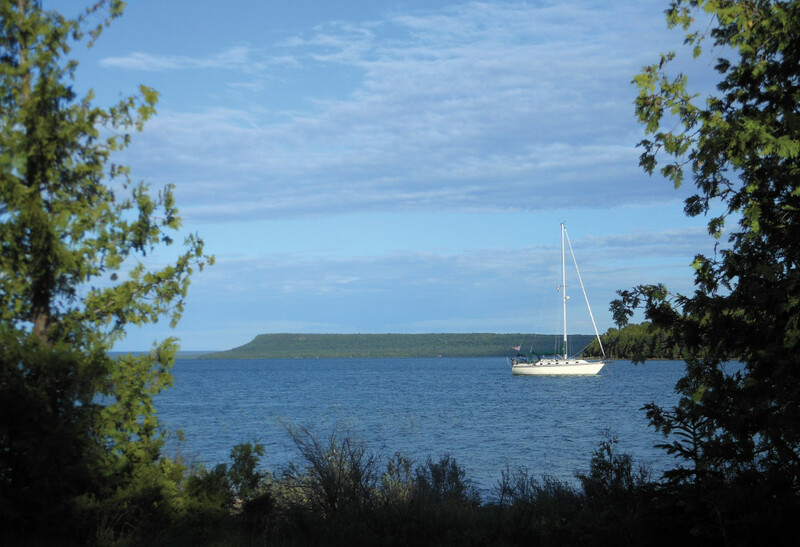 The south shore is rarely visited by cruising sailors, as its coves are mostly open to the prevailing southwesterlies and the open fetch of Lake Huron. Pick your weather window, though, and you will have a dozen anchorages to choose from. 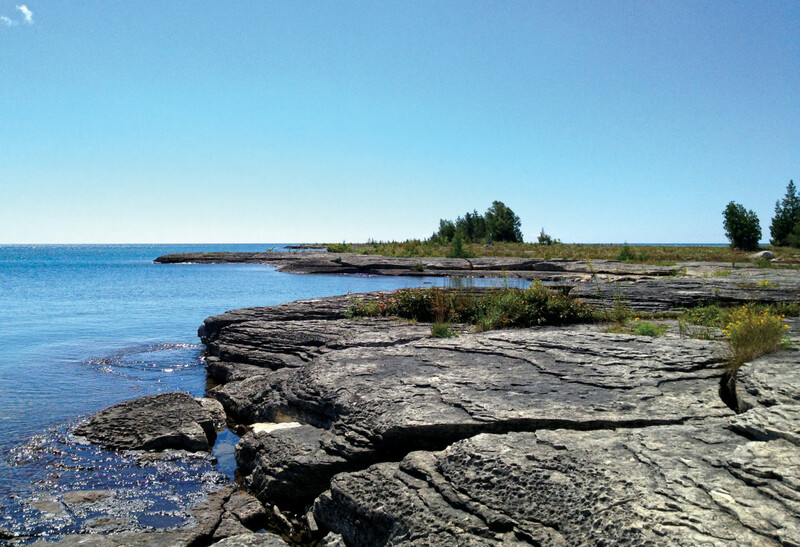 Most have sand beaches at their head and some have broad limestone expanses, known as alvars, with fossilized sea ferns exposed by eons of Lake Huron’s pounding waves. If your weather window holds, hop over to the Duck Islands, where you can climb sand dunes, snorkel over sunken wrecks and hike to the most remote lighthouse on the Great Lakes. Circumnavigating Manitoulin (check out Rattlesnake Harbour at the east end) takes at least a week, but you’ll be rewarded with some serious bragging rights back home. No matter where you are on the island, park your boat for a bit and hoof, hitchhike or hire a car so you can visit Lake Mindemoya in Manitoulin’s interior. Once there, rent a canoe and paddle out to Treasure Island, where you can walk on an island, on a lake, on an island, on a lake. Only on Manitoulin Island on Lake Huron can you do that.